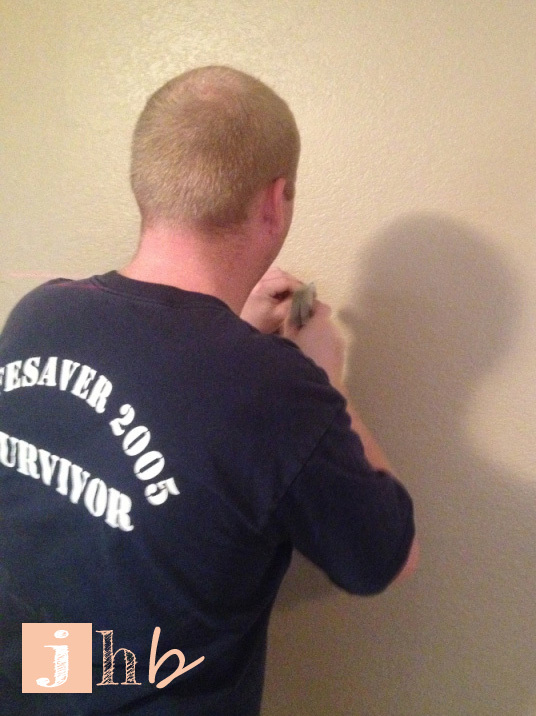 Here’s a story about a finishing touch. 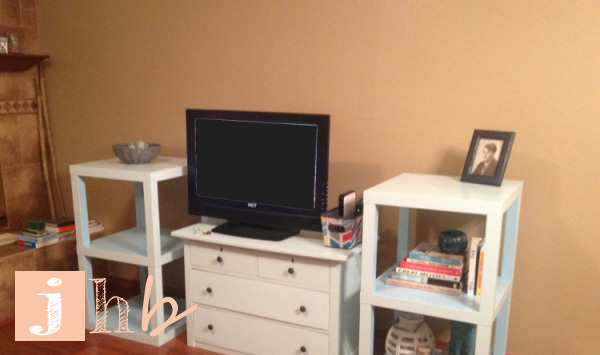 I’ve blogged about my media stand and the shelves I constructed out of inexpensive IKEA tables. Now it’s time to talk about the last bit I did to finish off the media area. Although I never really consider any area of our home “finished”. Our living space is ever-evolving! Check out the media area as I last left it here in blogland (please excuse my horrible photoshop job over the tv screen). I knew I didn’t want to hang a mirror. I have frames (that are still empty!!! need to get on that…) and a world map hung on the opposite wall and I didn’t want the reflection to compete with whatever we happen to be watching on TV. Fun fact – you can usually find us watching Arrested Development (with which the fella and I have an unhealthy obsession), Arrow, Undercover Boss, Master Chef or trying to find out who the gal with the yellow umbrella is. We love Netflix and Hulu. Cable Schmable. Who needs it. Back to the wall… After much careful deliberation I decided that artwork on a floating shelf would be a delight of a sight above the tv. I love all of the typographical artwork that peppers my Pinterest feed. 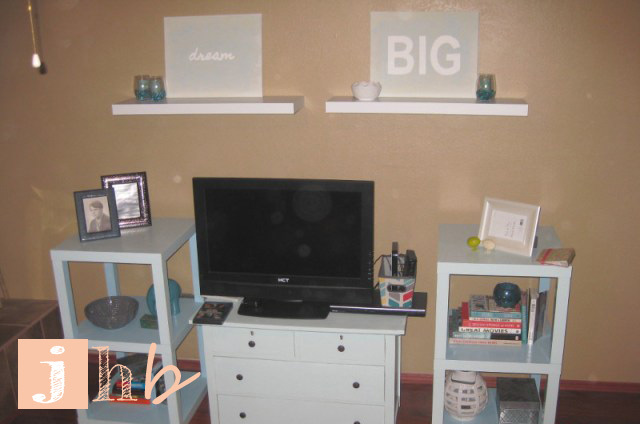 And artwork atop a shelf above the tv was just the thing to add height to our little setup. I have been known to sketch out my plans. 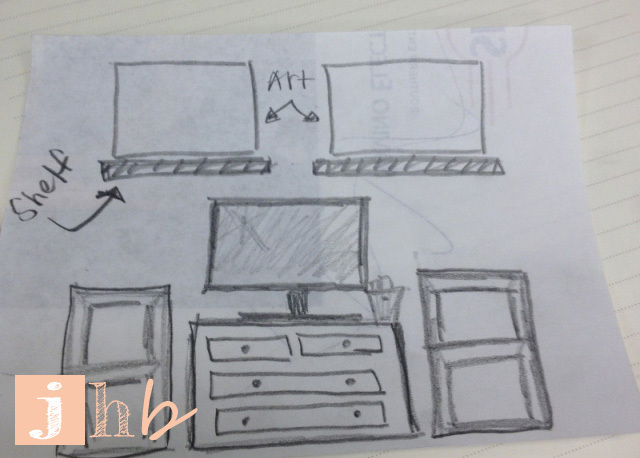 Not to scale or anything, I just like to put pen to paper to help visualize what I want my end result to look like. Fancy, no? And then it was off to Hobby Lobby I went, where thanks to a sale and my coupon from the HL phone app, I scored a two-pack of 16″ x 20″ canvases for a pretty nice price (I think it was around $8). 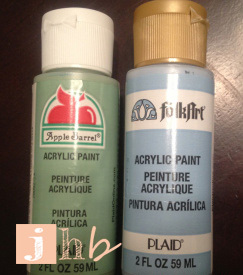 I have oodles of acrylic paint in my craft stash, so I picked a blue that was similar to my shelves and media stand and a soft green that resembled my jade-colored frame gallery (I’ll have to show that off on here at some point). 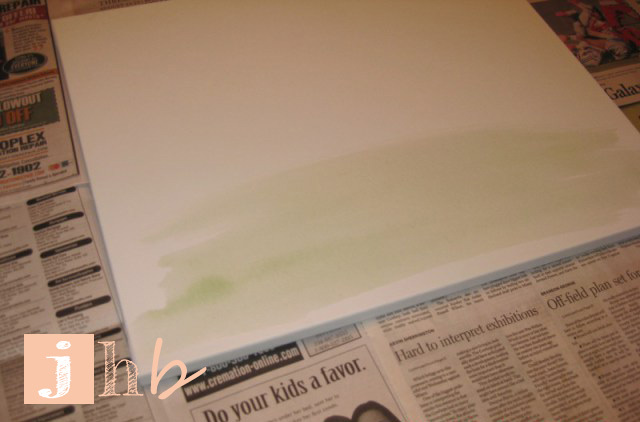 I went for a “washed” or “water colored” effect by mixing about one tbsp of paint with a few oz of water. I just squirted the paint right into a little jar, screwed the lid on tight, and shook it like crazy until it was mixed. There was no method to my painting madness – I just slathered the stuff on with a little coarse bristle brush until I liked the look of it. After one coat of green and one coat of blue these canvases were asking for more. So I gave them some wispy, whimsical squiggles courtesy of some leftover yarn in my stash. I soaked the yarn in the blue paint mixture for a few minutes and then laid it haphazardly on the canvases to create the squiggly lines. I then let them dry for around 24 hours. Then it was time for the fun part – the wording! “Dream big” is a serious statement. It serves as a reminder that we can definitely accomplish great things if we dream big enough and stay focused on our goals. It’s just the kind of encouragement I want to look at every time I walk in my front door. 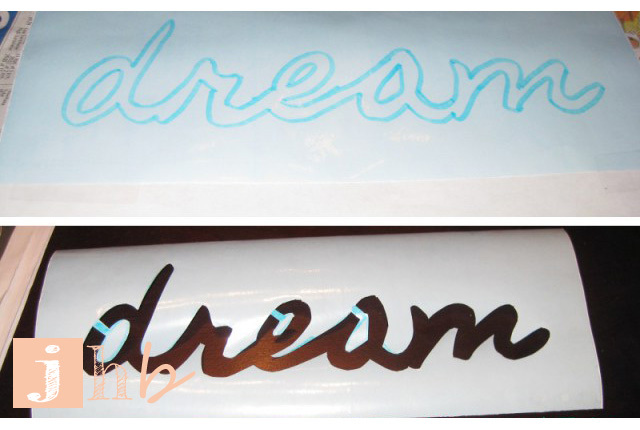 I went with a cursive font for the word dream and “impact” for the word BIG. I simply printed them out on paper and traced them on to my Martha stencil film, then cut the words out with my handy-dandy Xacto. 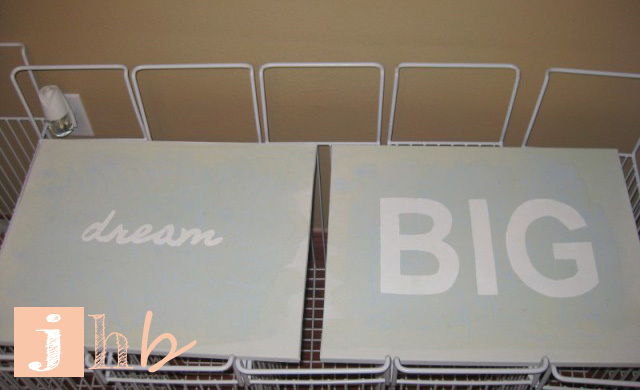 The stencils were carefully adhered to the canvases and I went to town with plain white acrylic paint. I had to keep little segments on the stencil on the d, e, a and b so that I could keep from painting the inside of the loops. 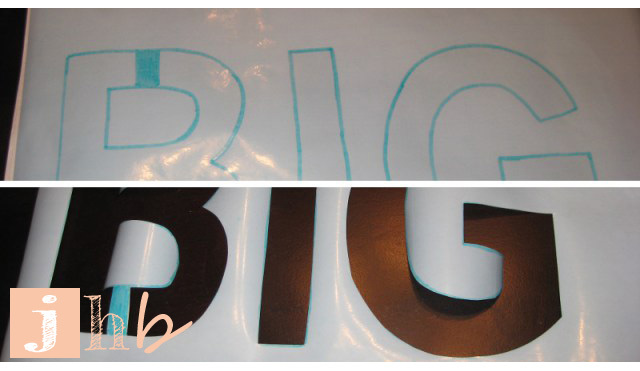 As soon as the words were painted, I carefully peeled off the stencils while they were still wet to keep the edges from peeling. Then I painted over the areas where my strips were to close my letter loops and let the canvases dry for another 24 hours. As for where these beauties hang out now, I bought two white 48″ floating shelves and mounted them to the wall according to the instructions. This took a lot of measuring, drilling and screw-driving, which my handsome fella was so gracious to help me with. I set my newly made artwork on the shelves with a few miscellaneous decorative items (they’re designed to hold around 30lbs each so I didn’t want to load them up crazy style). As for this “finishing touch” on our media area – I’m in love! It’s so nice to glance up there and get a little inspirational shot in the arm on the regular! This entry was posted in Decor, DIY, Home Decor and tagged art, artwork, paint, stencil, wall art. Bookmark the permalink.